Beth will not be pursuing the petition due to emergency medical concerns of a neighbor near the back of our neighborhood. She has also received little support for the speed humps which contributed to her decision. However, the city may choose to continue with the project on their own. We have not contacted them yet to inquire. Beth would like to ask neighbors to be respectful and encourage their guests to be respectful by not speeding through the neighborhood. Children are often coming and going from the common area, and speeding causes our streets to be a dangerous environment. Thank you! Who decides if the speed humps will be installed? What is the timeline for deciding this project? Residents in the impact area are to contact Beth DeGrassi, the petition leader, of 10310 Suffield Ct to sign the petition (in favor OR opposition) or voice any concerns. The petition must be returned by April 7th, 2010. Residents usually report that they are effective and generally support them. Have advantage of being largely self-enforcing and of creating a visual impression, real or imagined, that a street is not intended for speeding or “through” traffic. Potential to reduce accident rates. Potential noise reduction due to reduced volumes. Buses and emergency vehicles must pass over the humps at a low speed or risk possible loss of control. Longer emergency vehicle response times possible. Noise levels increase at the hump due to the noise of a vehicle going over the humps. 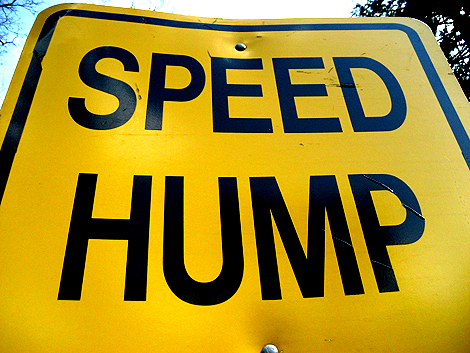 More potential for neighborhood conflicts since there may not be 100 percent support for the speed hump installation.